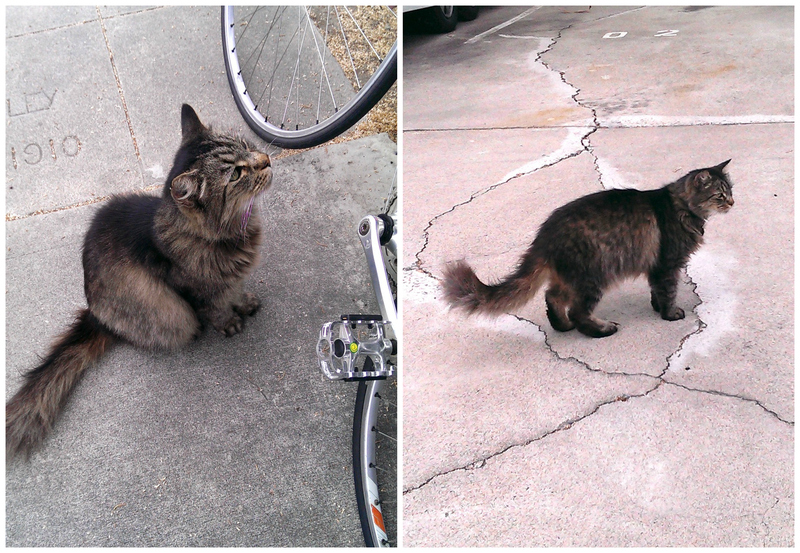 My favorite neighborhood cat is an old-timer. Fess (his real name) is at least 12 years-old (that’s how long he has been with his owners). 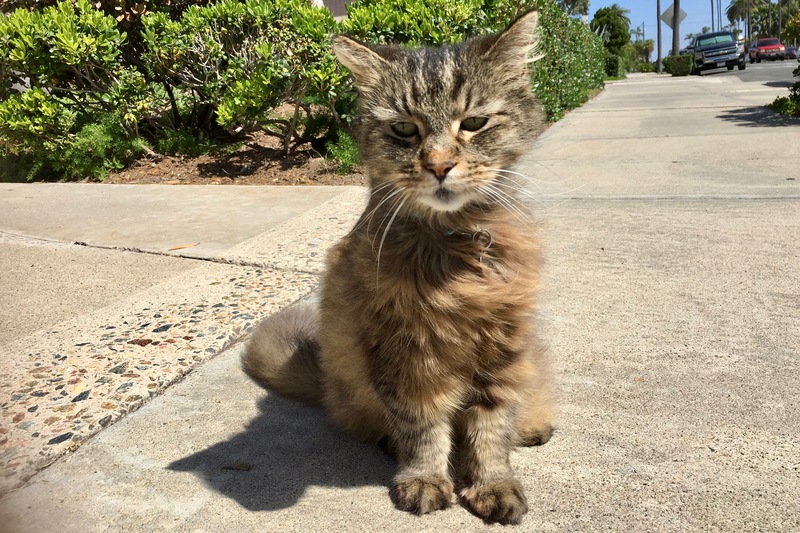 At one time, the Tom Cat roamed a wide territory around Cleveland Ave. and parallel street Maryland. In his youth, he was known to scale fences to poach from other animals’ food dishes. Now he stays fairly close to home. 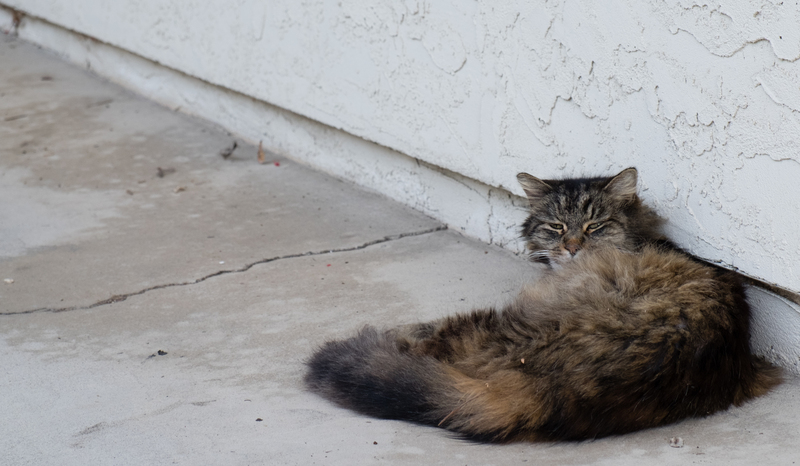 I often see him, in the driveway of the apartment where he lives, waiting for the master to come home. The gent drives a pick-up truck, and Fess jumps up into the cab when the door opens. We first met on July 27, 2013, a Saturday, as I rode my Guerciotti bicycle—gotten as a birthday present about two weeks earlier. The side-by-side pics are from that day, shot with HTC One M7 at 10:46 a.m. PDT on the left, and four minutes earlier on the right. Respective vitals: f/2, ISO 100, 1/2404 sec, 3.82mm; f/2, ISO 113, 1/6410 sec, 3.82mm. The Featured Image is more recent: April 24, 2016, 10:26 a.m. PDT, shot with iPhone 6s Plus. Vitals: f/2.2, ISO 25,1/1748 sec, 4.15mm. 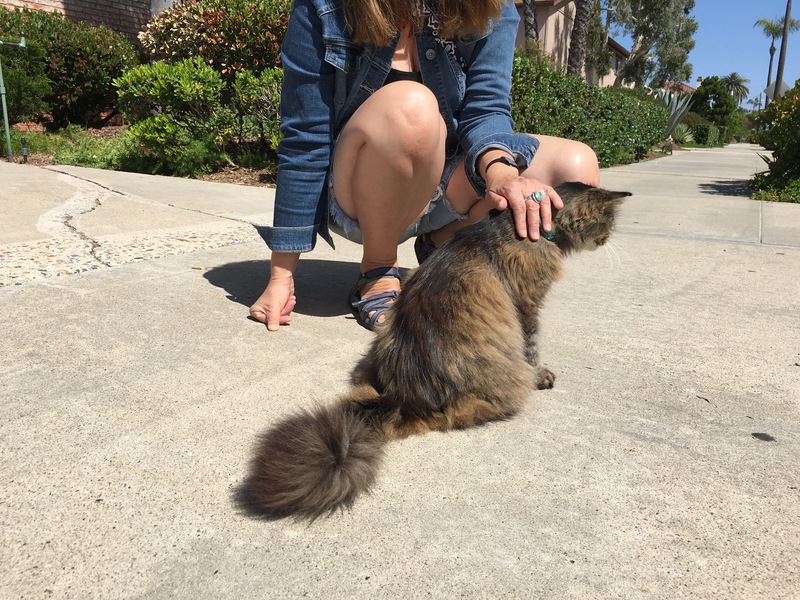 Taken the same day, three minutes later, my wife Anne pets the furball. Vitals are same as the other, except shutter: 1/1672 sec. The final photo shows Fess waiting for his owner, whose surname is Parker—hence the pet’s name. Perhaps you’ve heard of the actor? Eh, Davy Crockett! Fess obviously is not a youngster, but while a little unkempt from age he is well-cared for. Vitals for the last, shot on March 16, 2016, at 6:27 p.m. PST, using Fujifilm X-T1 and Fujinon XF18-55mmF2.8-4 R LM OIS lens: f/5.6, ISO 640, 1/160 sec, 55mm. Other feline friends from this series: Scruffy, Roly Poly, Woo, Skull, Biscuit, The Colonel, White, Chipper, Frisky, Stretch, Needy, Farfisa, Mates, Hunter, Pee-Pee, Blue, Blue Too, Bonded Pair, and Patience.